Thread: Lazy Sunday afternoon ... let's see some Hanharts! I'm shocking at taking photos and must buy myself a better set up. Anyway, it's Sunday arvo here in Melbourne and I'm wearing my 130XXX 1945 era Hanhart. 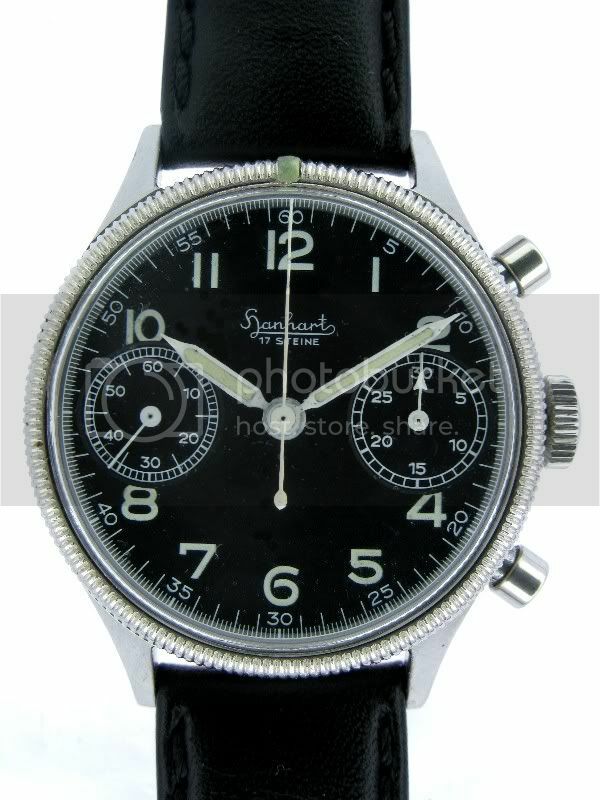 The watch came from the seller's wife's great uncle who was a Luftwaffe Technician at Rechlin Airforce Base. It has a Calibre 41 Hanhart movement with a Urofa Escapement which is correct for this era. Pusher caps were replaced when it was serviced by Herr Frank Roesky. The case with is in outstanding condition has not been polished or refinished. The watch looks like it's sat in a draw for over 60 years! Keeps great time and sports a rivited strap installed by Herr Roesky. Do we have a Hanhart specialist amongst the team who can tell me more about my watch? I've wondered why some of these have turning bezels while others, like mine, don't. Here's my much later 417 ES, in service with the Luftwaffe much, much later - I don't think I've shown this before? (I'm planning a detailed thread about these later Luftwaffe "Starfighter" chrono's). This 417 ES has the stainless steel case, whereas Al's 417 version has the plated case. Photo courtesy of Zaf @ Classicwatch. Yours is one of the best I have ever seen, truly remarkable. 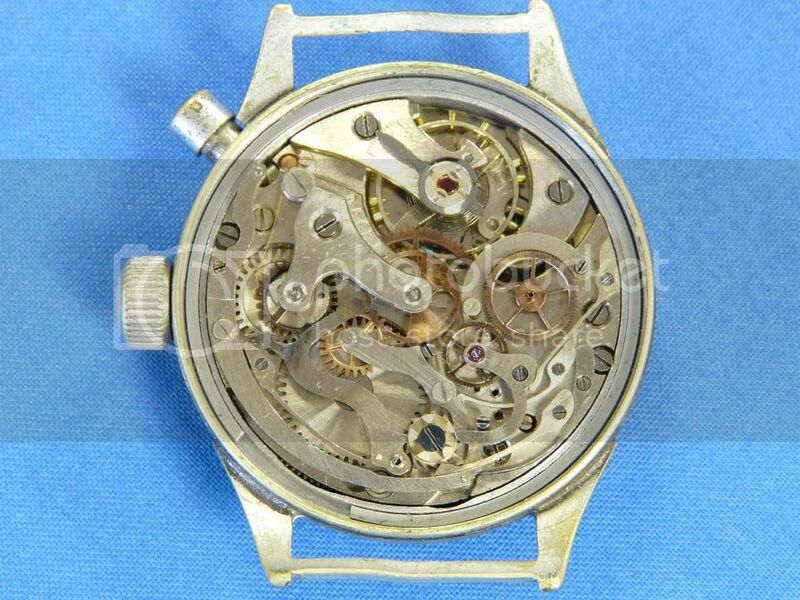 Does the movement number match the caseback number? If you read that other thread, yours is a late "version 3". As far as I know, exact dates of manufacture are not known but it's thought that the single pusher calibre 40 appeared in 1940, followed by the double pusher calibre 41 in 1941. 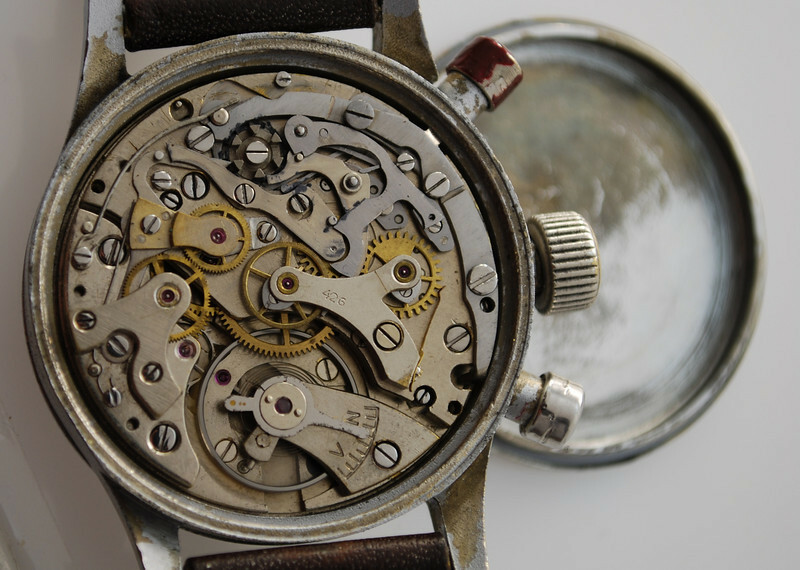 When the cal 41 double pusher movement appeared, the earlier cal 40 single pusher cases were supposedly modified to take the new movement and double pushers. It is thought that either both the plain and coin-edge bezels (possibly copied from Tutima) were made concurrently until the plain one was discontinued or alternatively, perhaps an order was given for a batch of cal 41 watches with plain bezels. Yours is a late serial number which doesn't really support either theory (the serial number is much later than the other "version 3"s, so it would seem that the cal 41 could be ordered with either bezel. That would make sense, considering it's original owner was a technician rather than a pilot. I know there are more Hanharts out there, where are they? Last edited by StampeSV4; 14-02-2010 at 16:58. Chris - have a look at the recent posts in the last 24 hours on "The most desirable military chronograph" thread for more Hanharts http://forum.atgvintagewatches.com/s...?t=1867&page=3. Last edited by StampeSV4; 15-02-2010 at 11:21. This kind of post makes me think of something. I have a large Military watch pic archive culled from the net over Many years... I am thinking of loading the ATG Gallery with them so that we have a full resource. I can do the same for Heuer, Zenith Rolex, Breitling and just about any other brand. However I have been toying with the idea of making these Galleries private and only available to the ATG Members. This keeps the resource for ATG members but keeps them out of the way of prying scammers. Another issue is that I would want to 'watermark' them less some unscrupulous person use them for miss representation. Then that throws up the quandry of how do I feel about loading someone elses pic into the ATG Gallery with an ATG watermark on it... what do you reckon Jonathan... do I need a disclaimer....? What does anyone else think? Shall I load up the Galleries...? Excellent idea - particularly keeping its access limited to ATG members only. ATG photos should definitely be watermarked but where the source of the photo is unknown, why not simply say that (and credit it later should the source become known)? It could be further controlled by only allowing access after, say, 10 or more posts on NSN 6645? That way it should stop anyone signing up purely to access the gallery. Last edited by StampeSV4; 15-02-2010 at 15:46. Hello, I am a new guy here. Someone you know grabbed me on a Russian watch forum and invited me here (hello StampeSV4!). So I thought I could contribute to this thread with this Soviet Kirova Type-59 flyback chronograph from 1947. It has a German made movement and Russian case, dial and hands. It is one of the first produced in Moscow, maybe even from a prototype run. This model has its roots in the German Urofa-Ufag group founded in 1926. Urofa (Uhren Rohwerke Fabrik Glashütte AG), made ebauches; the other, Ufag (Uhrenfabrik Glashütte AG), made finished watches. The brand they created for the watches was Tutima, from the Latin word tutus, which means "safe" or "protected". When the WWII came, the German military placed orders with Urofa-Ufag for a watch for the German Air Force: Luftwaffe. The Flieger Chronograph was ready in 1941. It contained the hand wound Urofa caliber 59 with a 30-minute register and small seconds hand subdial. It has 17 jewels and runs at 18,000bph. This movement has a flyback complication, meaning that while the chronograph is running, momentarily pressing the lower pusher will cause the chronograph to reset but otherwise continue running. It has a nickel-plated brass case, screw down caseback, knurled rotating bezel and a domed acrylic crystal. It's 39mm across not including the crown, 13mm thick, and takes a 20mm strap. The movement met the army’s specifications of a deviation of no more than -3/+12 seconds on a daily average within a temperature range of -10 to +40 degrees Centigrade. 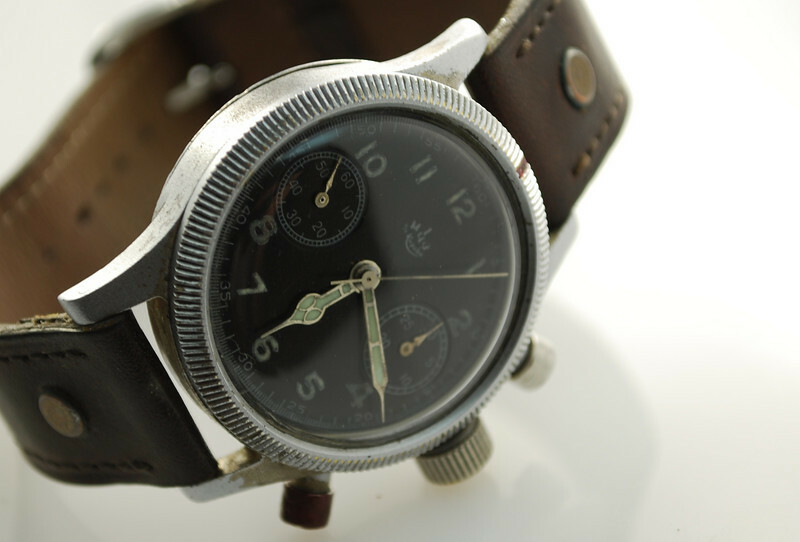 Between 1941 and 1945, Urofa-Ufag supplied around 30,000 Flieger Chronographs to the German Air Force. It turned out to be the last watch the Glashütte group ever made. In the spring of 1945, with the German Army nearly defeated, the factory ceased production. The Allied powers divided Germany into four post-war zones. The state of Saxony, which included Glashütte, was part of the Soviet Occupation zone. The Russians were impressed by what they found in Glashütte, and promptly took the design, remaining parts, and manufacturing machinery for the watch as war reparations. The assembly line was dismantled and shipped to Moscow, where it was reinstalled at the newly renamed First Moscow Watch Factory. Starting in 1947 the First Moscow Watch Factory produced Tutima-Urofa chronographs using original parts taken from Glashütte, but with a FMWF-signed dial and a Russian made case (this watch). 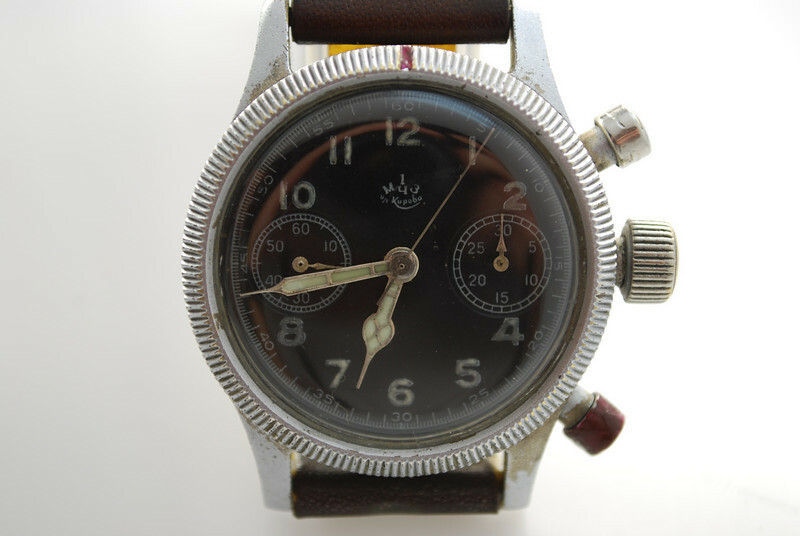 By 1949 the captured German machines were operational and a small number of Type-59 chronographs were being produced with parts made entirely in Moscow. That is why I love vintage watches. They do not only the tell the history - they are part of it. Last edited by Lucidor; 16-02-2010 at 19:19. Thought I'd copy over this post on KM Hanharts to this thread (it's from the "Most desirable Chrono" thread). .. Most of the ones I've seen so far have been brassy with the emblem on the case back. Haven't seen any in exceptional condition other then one on MWR, posted by foilguy. This one is unusual as it doesn't have a bezel and the case back markings are more common to those found on Luftwaffe issued pieces... and if you're wondering case & movement numbers match. Curious. So the seller's / auction house's story is that it was taken from the pilot of a Heinkel 111 shot down over the South Downs. Why would a Heinkel 111 be wearing a Kriegsmarine issued watch? Who knows? Maybe his brother was a U-Boat captain and they swapped? Maybe he was a KM pilot on loan to the Luftwaffe? Maybe he was in the KM but on the Heinkel to gather intelligence, i.e. for a birds-eye view of what lay in store for the KM when Operation Sealion started? (It's a single pusher cal 40 movement which first appeared in 1940, hence the name cal 40 as opposed to cal 41 for the double pusher movement which appeared in '41). 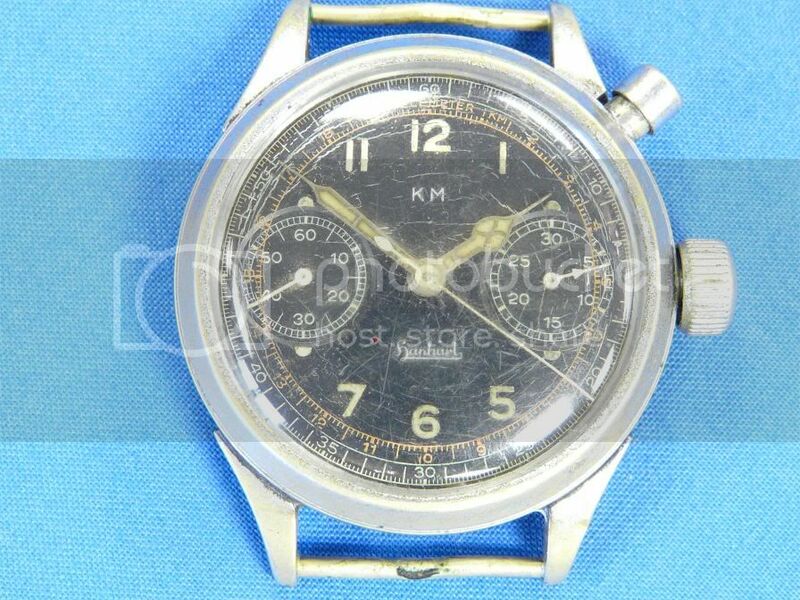 If genuine, this must be the earliest known example of a KM Hanhart as it has the cal 40 movement and the plain bezel, before they copied the coin-edge bezel from Tutima, so it could make sense - the only confusing bit is why it was up in the air rather than below the sea? A further conundrum is that I thought that these KM marked watches were specially ordered by the KM rather than via a central purchasing depot / department. The watch does look like it consists of all Hanhart parts but I guess that doesn't mean that they all left the factory at the same time, yet I gather the movement and caseback numbers match. I suppose the simple answer for the suspicious is that it has just had the dial swapped, . I'll have a look at my source material tonight. 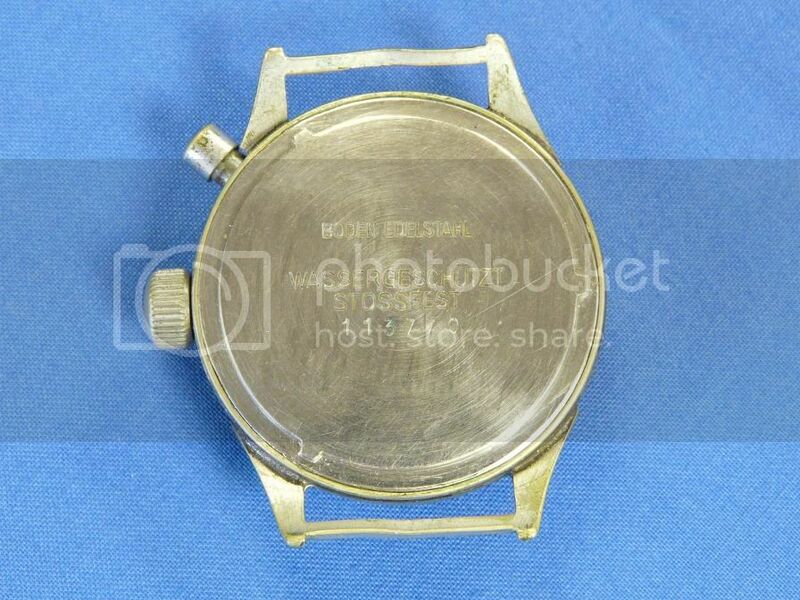 Most watches that have actually been issued and/or and seen service will probably have been pulled apart and had parts swapped over from other broken watches to repair them when in the QM's stores, although I don't know if these Hanharts would have been repaired in the services or returned to the Hanhart factory. Either way, it's watches like this that differ from known examples which keep it interesting. Great to see you here, Lars. I think your Type-59 was previously owned by Thierry, who is also a member here (do you have a link to his site handy for everyone else?). It has survived extremely well, right down to the red paint on the coin-edge bezel and fly-back pusher. That even looks like the original strap? (I still need to take some photos of these watches in Konrad Knirim's book for you, showing the interesting octagonal caseback). I know you have some other interesting Soviet aviators - looking forward to seeing them too. By the way, please check your pm box.